Supervised by L.B. Abbot,this film features an effective miniature storm sequence. Doctor Dolittle's boat the Flounder was represented by an 11 foot 6 inch model (3.5m) at 2 inches to the foot scale which is 1/6 of the full size boat's dimensions. It was photographed in Fox's Serson lake at Malibu. If you look carefully you can see regions of white water being created by underwater airlines which is then whipped away by the blast from a series of wind machines, making a very effective stormy ocean surface. The Flounder model is then capsized by a wave from a dump tank. The Flounder model on display. All the miniature construction was supervised by the head of the miniature prop department, Gaile Brown and included an 8 foot (2.4m) long mechanical whale attached to a flange wheeled dolly which traveled along an underwater track and pulled by a steel cable and a winch. It was able to dive and surface, had a working blowhole and a flapping tail mechanism along with air hoses to produce the wake and tail fluke white water effects. A miniature version of the floating island Seastar, was built 80 feet (24.4m) wide, which employed a number of 44 gallon drums that could be partially filled with water enabling it to float at the right level. There was a matching section of African coastline 300 feet (91.4m) wide and what appears to be a close up larger scale section where two halves of a tree come together. Added to the mechanical whale creatures was a miniature flying giant moth complete with a miniature Doctor shot against blue screen and composited against a matte painted sky and a miniature version of the giant sea snail also shot in the Sersen tank. I remember being totally captivated by this film when I was taken to see it at the cinema as a child of around 5 or 6. I really believed that the Push me Pull you double headed Llama creature was real and I was astounded when the two bits of land and particularly the tree came together like a jigsaw. Source: Special Effects - Wire tape and Rubber Band Style by L.B.Abbott, ASC Press 1984. Fantasy II Film effects handled the miniature ship visual effects on this. 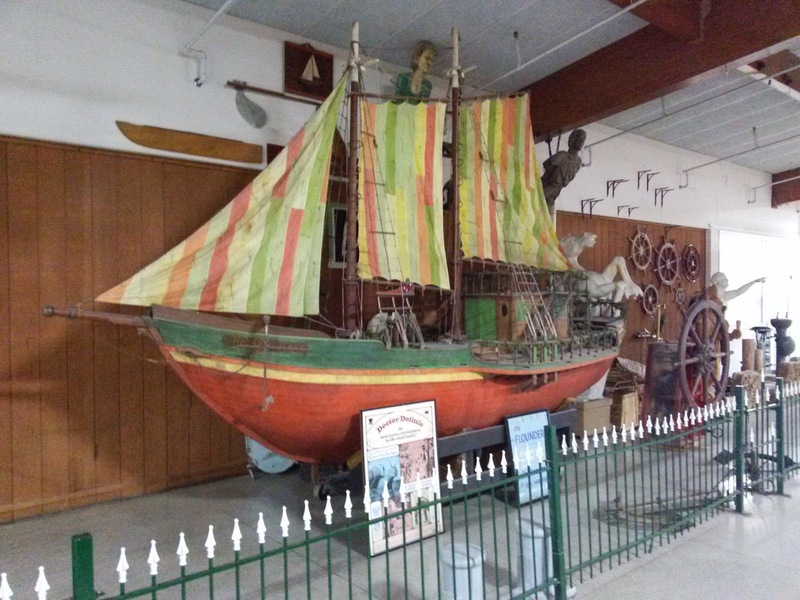 The ship model is about 30 feet long according to this blog. It would have been shot in their tank which was in Sun Valley California. Some shots include a scale radio controlled helicopter. The pyrotechnic destruction is particularly impressive.